It happens to any number of public figures – leaders. The President of the United States, the Queen of England, the Pope. They go about for some important event and the crowds gather. The photographers stake out the best vantage point for their still shots and videos. The reporters line up various commentators. And they wait to cheer and greet the leader. Today, Saint Luke tells of a similar situation, but on a far more cosmic scale. This was not some ordinary governor or president or even king. The Lord God-in-the-flesh was visiting Jerusalem. The Savior King was arriving in the holy city, being greeted by cheering crowds who were singing of their joy to have the Son of David among them. They were filled with joy to have the Messiah come to their city – and they were close enough to see Him in person! The Messiah coming to Jerusalem meant that something important was about to happen. He would soon be declared King! But not everyone was pleased to have Him come. There were some who did not want to see the Christ. Some who thought Him to be a radical Teacher. They thought He should have stayed a simple carpenter in an obscure town. He was stirring up too much trouble. Still others thought of Him in terms of earthly leadership. They felt more like having a political convention – or at least a nationalistic riot – there on the streets of Jerusalem. They were nominating Jesus to cast out the Romans! But don’t cast your judgment on them too quickly. You join them as well. There are times when you are not thrilled that Christ is coming. Yes, you might join in the Hosannas to the Son of David, but still have no desire to meet our Savior at any given moment. You might acknowledge Him as a great model and Teacher, but want to meet Him on your own schedule and on your own terms. We all stand accused. How many of you really wanted our Lord Jesus to come before you graduated from high school? How many on your wedding day wanted the Lord to come and take us all to heaven? Who really wanted our Savior to return and come in glory before their baby was born? How often have you thought, “Sure, Jesus, I pray that You will come, but wait until this or that landmark in my life is past.” Face it, we all are very selfish and want everything on our own terms. We want Jesus when He’s convenient, and not when we think He’s imposing. We end up on the side of the small but vocal minority in Jerusalem who were not participating in this parade route. People who later in the week were shouting for Jesus’ death. People who did not have faith. Our hearts are heavy with pity when we stop and think about such people. Those who have no desire for Jesus’ coming, those who have no faith and want nothing to do with our Savior, have no hope. They will not know the peace and glory that comes from Christ. Yet our Lord Jesus came desiring their salvation too. Our Savior was conceived by the Holy Spirit and born of the Virgin Mary to come among His people. And as He came, He preached His Gospel to all, seeking to save the lost. Jesus Christ came in the Name of the Lord. He may have appeared to be a simple carpenter-turned-rabbi, but He came to be Immanuel – God-with-us! And as Immanuel, He came to bring peace and glory. Who is this King of Glory? And what peace does He bring? In our day and age, many have come and gone speaking of “peace.” Whether drugged out hippies, ivory tower college professors, or international diplomats, everyone has a differing idea of what “peace” is. For some peace is the destruction of all weapons. For others, it is an ideal society, built on some community master-plan like Walt Disney’s original ideas for EPCOT. For others, it is a great treaty between nations. the joy, assurance, and lasting hope that we have in Christ. It is the comfort of knowing that our sin is forgiven. That even though we have not always welcomed our Savior, He still loves us, forgives us, and desires to come to us! The peace of the Lord is not simply some removal of famine or bloodshed, but the gift of eternal life, assured to be ours through the Messiah. The peace of the Lord comes to us when the Lord Himself comes to us. 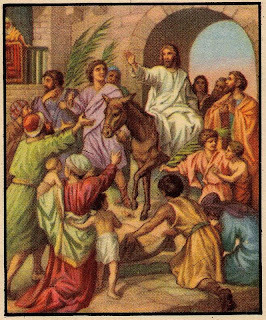 For those in Jerusalem, Jesus was present as He rode through the streets on a donkey. There, Jesus brought the peace of the Lord to those who heard Him and saw Him, and were given faith. For you and me, the peace of the Lord has been coming today through His Holy Word. 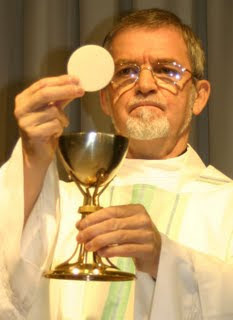 And in a matter of moments, the peace of the Lord will come when Jesus Christ enters bread and wine, giving us His Holy and Precious Body and Blood. That is why the ancient custom is for the pastor to hold high the Flesh and Blood of Christ after the Words of our Lord have been declared, and he says: “The peace of the Lord be with you always.” At that moment, Jesus is again declaring absolution to you, releasing you from your sin as He shows you the peace that you are about to consume. Not only does Jesus bring peace when He comes, but He brings the glory of God as well. What is the glory of God? Is it light shining? Is it praise, like the angels over Bethlehem? Is it power? Well, it is these, and far more. The glory of God is brought to us by His presence. The Ark of the Covenant was the throne of Almighty God as He ruled over Israel. As this holy seat was carried from place to place, from Sinai to Canaan, and eventually Jerusalem, God was present. The Lord led Israel by a pillar of cloud by day, and a pillar of fire by night. These phenomena showed His presence to His people. And not just an ethereal presence – not just some ghost-like apparition. God was physically locating Himself in that pillar. The bright pillar displayed God’s glory – at least as much of His glory as can be seen by fallen human flesh. The glory of the Lord is still present whenever He is present. And the Lord God has promised to be present wherever His Word is purely taught and His Sacraments are rightly administered. From the moment of invocation, when God places His Name upon us, to His blessing, when He places His Name on us again, He bestows His peace and glory. Many of the people who sang and shouted on the streets of Jerusalem were thrilled to see Jesus coming. They had no idea how true it is that this Man would bring the peace and glory of God to them. God-in-the-flesh – Immanuel – the Son of David – Jesus Christ was coming and bringing the peace and glory of God for every man, woman, and child ever to live on this earth! Look, dear friends in Christ. The King draws near. Jesus is about to come again, in the flesh, bringing His peace and the glory of God. The long-expected Jesus is about to come again and set His people free, blessing us with His His glory and peace in their purest forms: His own Body and Blood, delivered in His Holy Eucharist. "Hosanna! Blessed is the King who comes in the name of the Lord! Peace in heaven and glory in the highest!"